Greenhouses, Hobby Greenhouse Kits designed with Single Glass, Double Glass, Twinwall Polycarbonate and Five Wall Polycarbonate. With over 8,000 greenhouse models, you are sure to find the right greenhouse for you at BackyardGreenhouses.ca, your online source for everything related to free standing greenhouses, lean-to greenhouse styles and greenhouse accessories. Commercial greenhouses and custom greenhouses welcome! We ship our Canadian-made Greenhouse kits throughout Canada and the USA. Proud member of the Hobby Greenhouse Association. 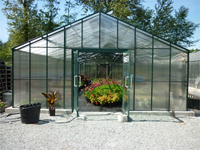 Backyard Greenhouses is one of Canada's largest suppliers of Hobby Greenhouse Kits, Greenhouses and Garden Greenhouses fabricated of Single Glass, Double Glass, Twinwall Polycarbonate and Fivewall Polycarbonate. We are not simply a "dot com" company. We've been in business since 1972 and have shared our extensive greenhouse experience with our many customers for more than 35 years. We take pride in delivering the best possible shopping experience to all our greenhouse customers. That means from the moment you enter www.backyardgreenhouses.ca website to the moment your order is delivered to you - we are fully committed to your satisfaction. All greenhouse products list specifically where they are shipped free of charge. For shipping rates outside these areas, general inquiries, or to place your order by telephone or fax please Contact Us. Browse through our wide selection of Greenhouses, Hobby Kit Greenhouses, Lean-to Greenhouses, Gardening Greenhouses, Portable Greenhouses, Atriums and much, much more and discover the perfect greenhouse for you. And, remember, all our Canadian Greenhouses are proudly "Made in Canada".